cook them—pair up, the results are delicious. A seared tuna appetizer is served with sushi-inspired accents—wasabi, pickled ginger, hot mustard, and sesame seeds. During his notable career as a guide in the Florida Keys—as well as in the Bahamas, Mexico’s Yucatán Peninsula, Costa Rica, and Belize,—Cochran, who earned art degrees in ceramics and painting at the University of South Florida, enjoyed depicting the natural subjects he observed. “I have always been an artist,” he says. When he and his wife, Jean, decided to settle back in his hometown of St. Augustine, they operated Blackfly Gallery and Fly Fishing Outfitter on Aviles Street. One day, a fellow downtown buisness owner stopped in—Mike Hyatt, co-owner of Collage Restaurant, located at 60 Hypolita Street. The two started talking shop and had an immediate rapport. The conversations continued when Vaughn and Jean reciprocated and dined at Collage. Outside of the dining room, the two entrepreneurs continued their discussions along with their wives and business partners, Jean and Cindy Stangby. The Blackfly brand—a recognizable symbol for not only Vaughn’s worldwide fishing guide tours but also his artwork, line of apparel, and fishing resort in the Bahamas—was well established. Mike and Cindy brought a great track record as successful restaurateurs to the table. The husband-and-wife team had relocated to St. Augustine from Midland, Texas after selling a successful restaurant there they owned and operated. “We were looking for a more interesting place to live than the desert,” Hyatt explains. “We had friends—Doug and Charlene Bunnell—who lived in St. Augustine, visited them, and fell in love.” They purchased La Parisienne restaurant, which had been a fixture of St. Augustine’s fine dining scene for decades and made a bold move—they changed it completely. Mike and Cindy transformed what had become a staid concept into a world-class restaurant reflecting the couple’s eclectic tastes and passion for quality. The region quickly took note and Collage earned numerous accolades and awards. Not surprisingly, Mike and Cindy’s freinds who introduced them to St. Augustine—the Bunnells—stepped in as the third couple in the triumvirate of partners that brought Blackfly The Restaurant to fruition. Blackfly’s location—the longtime site of Seafood Kitchen—had been extensively rehabbed and operated as Zhanras for 7 years. Located just over the Bridge of Lions with proximity to historic downtown, ample parking, and easy accessiblity for Anastasia Island residents. The Blackfly partners painted, refurbished, and remodeled once again and opened their doors in June 2012. Now aqua-, seaglass-, and sunset-hued walls throughout the restaurant are decorated with Cochran’s colorful paintings, prints, and murals. A glowing wood-fired pizza oven, located at the main entrance to the restaurant, beckons with warmth and tempting aromas. Blackfly has become a favorite with both locals and visitors—Happy Hour in the bar features specialty cocktails, craft beers, and selections from the extensive wine list with more than 100 selections from all over the world. The glass-walled wine room holds more than 1,000 bottles and is a focal point of the main dining room. Built by partner Doug Bunnell, this visible vault keeps all of the vintages at an optimal 60 degrees Fahrenheit. In addition to dining in the main dining room or more casually in the bar, Blackfly also features a private dining room and bar called The Shores Room. This separate, cozy room featuring a gleaming, full length mahoghany bar, is used for private parties such as rehearsal dinners, birthday parties, and business dinners. With a vintage, beachy vibe, the atmosphere is Key West casual yet elegant in every detail. Case in point are Blackfly’s brick oven specialty pizzas, especially popular with bar customers who often opt to share a pizza or selection of appetizers. Blackfly’s Angler’s Bar, opens an hour before the dining room at 4 p.m. Weekly specials— Tapas Tuesday, featuring tapas specials at the Bar all night; Winey Wednesday, with 25 bottles of wine for $20 or less; and Ladies Night every Thursday—keep Blackfly top of mind with locals. 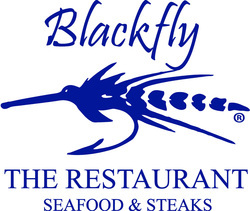 Blackfly The Restaurant is open for dinner Tuesday to Sunday from 5 p.m. Full bar features Happy Hour from 4-6:30 p.m. Temperature-controlled wine room and extensive wine list. The Shores Room, with its own private bar, has room for parties of up to 40. Located walking distance from downtown, just east of the Bridge of Lions on Anastasia Boulevard, Blackfly The Restaurant is open Tuesday through Sunday at 5 p.m. for dinner. The popular Angler’s Bar opens at 4 p.m. and features Happy Hour till 6:30 p.m.
Succulent fresh seafood is always the specialty of the day at Blackfly. “WE'RE KNOWN FOR OUR DAILY FRESH FISH SPECIALS USING LOCAL CAUGHT FISH THAT YOU USUALLY DON'T SEE ON MOST RESTAURANT MENUS ALONG WITH OUR SELECT FILLETS OF WAHOO, MAHI, HOG SNAPPER, AND OTHER SPECIALTY FISH." Artfully prepared appetizers and desserts change daily. “OUR ANGLER'S BAR HAS BECOME A LOCAL FAVORITE. IT'S THE PERFECT PLACE TO COME WITH FRIENDS AFTER WORK OR LATE NIGHT TO SHARE FOOD, DRINKS, AND, OF COURSE, SOME FISH STORIES." Creamy lobster and corn chowder is garnished with infused basil oil and succulent claw and tail meat.